While the American media has its eye on Ukraine and the US-Russia proxy-war occurring there, significant events are unfolding closer to home in Venezuela. The population, economically crushed by years of deprivation under a Communist regime now led by Nicolas Maduro, has been taking to the streets in increasingly desperate protest. This is a chart for Venezuela's independence: it suggests a journey through Left-wing authoritarianism slowly (perhaps very slowly) making its way towards a society with a high degree of personal freedom. Libertarian (over time): Pallas conjunct North Node and Mercury (ruler of Pallas) square the Nodes and Pallas. Leftist: Neptune is opposite Venus and quindecile her ruler Mercury (who also rules the Second House). Capitalist (over time): North Node in the Second. Nodes are square Mercury (rules the Second House and Venus). Liberal: Neptune in the Fourth House trine Uranus (Fourth House co-ruler). The Fourth House is ruled by Mars (trine South Node) and Pluto (conjunct South Node). This chart depicts transits and progressions for the beginning of the bloody Caracazo riots which arguably marked the start of the country's current cycle of political turmoil and oppression. One could say a great deal about this chart, but one long-term factor stands out. Pallas has just progressed into Sagittarius. 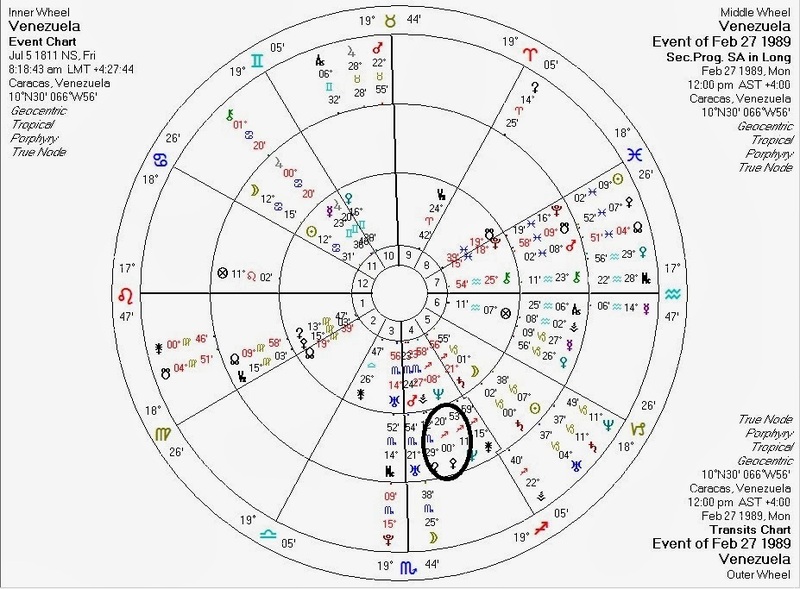 This sign is ruled by Jupiter which is square Pluto and the Nodes on the Venezuela independence chart. It suggests the start of a long period, lasting over a century, of initially losing and (hopefully) finding one's way on the Palladian scale between force and consent. 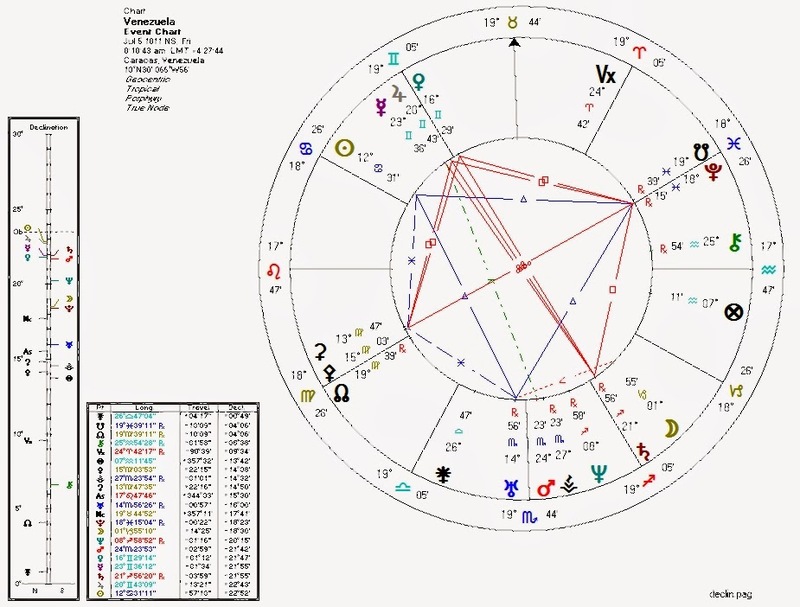 Transiting Pluto opposite Venezuela Sun and transiting Uranus square Venezuela Sun: revolution (again)? Solar Arc Saturn conjunct Venezuela Sun: in Cancer in the Eleventh House suggesting struggles regarding the public and society. 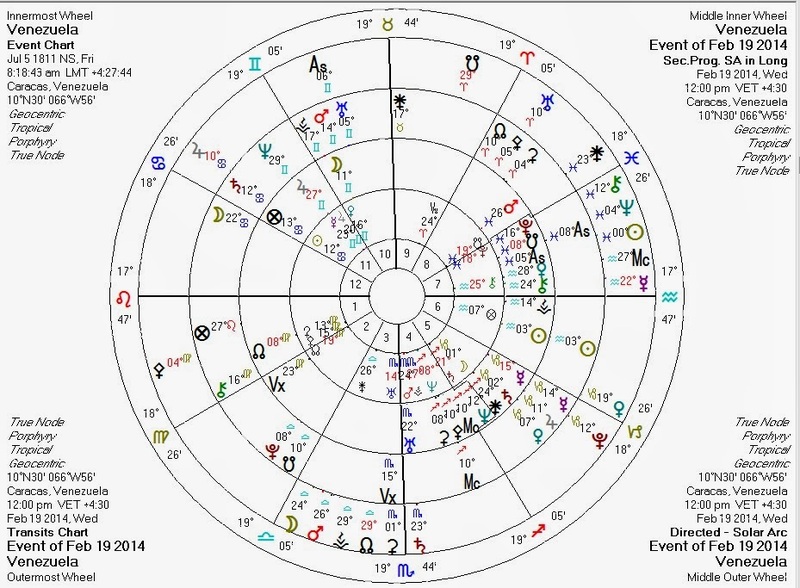 Transiting Saturn at the IC: struggles on the home front, and the solidification of opposition to the party in power.